Humans are indeed created in the image of God. In us, God has planted the desire for eternity, and for true happiness–in other words, for God. The difficulty is that sin misdirects our desire and fools us into thinking that other things will satisfy us. Most of the stuff we see around us every day reinforces this false belief. Things cannot make us happy, no matter what the advertisements say. We are also deceived in our self-image. That is, we are mistaken about who we are and what makes us good. The good that we are, and the good that we do comes from the Good itself: God. God created us in his image so that we might reflect it to one another and respect it in one another. This means, however, that we belong not only to ourselves, but to God and to our neighbors. So we are not meant to take our own lives in the same way that we are not meant to take the lives of others: they do not belong to us, to do with what we will. But there is more. Choosing to live for the sake of bearing God’s image, when I am not sure I bear it clearly enough for anyone to make it out…is just not appealing. That’s when I think I ought to carry on because of the stuff that I do. If I am not around for my kids, for example, who will be? On a better day, I might even think about the theological work that I do. I should stick around; I might eventually do some good, when the dark fog lifts. Wrong–for two reasons. First, the lifting of the dark fog is only ever temporary. Depression is a little bit like the weather. The sun may shine, but the rain is bound to return eventually. Second, and way more importantly, the good I might do, whether for my kids or for the world, is not what makes me significant. I tend to think that the meaning of my life is somehow bound up with what I can accomplish. (Nothing against accomplishments, here! They’re good.) It’s not true. God hasn’t put us in the world to do stuff, as if there were stuff he couldn’t get done on his own. The essential feature of human life is its relationship to God: to be loved by God, and to learn to love in return. That’s it. Suicide might seem like the solution to the weary, grey, and lifeless burden of depression. After all, even if it does go away, the fog will return. Whatever happens after suicide, I’m guessing depression (as it’s related to our way of being in the world in this life) isn’t going to be part of it. It’s hard to endure depression because it hurts, it slows me down, it makes me feel as if nothing I have done or will do justifies my existence on this planet. But what if my existence on this planet is already justified by God? What if I don’t have to do anything? What if God is like that teacher in Florida who compliments his students every day–if only I would come forward and listen? Here’s what I have learned: self-respect is much, much more difficult than self-hatred. Hating yourself is easy: the whole world displays for us what we ought to be and do. And we fail. (At least I do–maybe some folks don’t.) So the natural response is to think, ‘I really ought to try harder. I could do better, couldn’t I?’ Then, when trying harder doesn’t do it, and I’m exhausted from the effort, I think, ‘Well, maybe I am just not good enough.’ Enter self-loathing. Self-respect, on the other hand, has to refuse the comparison. Self-respect has to be satisfied with what is truly my best effort and not reject it because it doesn’t produce the hoped-for results. Maybe it’s good news, then, that self-hatred is sin. Not because now we can condemn it in one another–heavens, no! It’s good news because seeing this self-hating orientation as misdirection, as a turning away from God as well as an attack on self (an inward turning! ), puts it in the light of grace. That doesn’t make it go away, but it does make fighting it part of the good fight of faith. Peter Singer is right. He’s recently argued that infants born with severe disabilities are not deserving of the same level of care as you, or me, or our healthy babies. He’s right, that is, if you believe that people are ultimately for walking and talking and interacting with other human beings on this earth. If that were the purpose of human life, if human life had no spiritual or eternal dimension, Peter Singer would be right: use the resources we have for the people who are fulfilling their purpose in life. But that is not what human life is about, ultimately. Each human being is created for eternal delight in God. And the relationship of each human being to the God in whom we have our being originates with God, not with us. The Scripture tells us that God fashioned us while we were still in the womb; God knows us more intimately than we know ourselves. God gives us our purpose, which is to glorify God and to enjoy God forever (as the Westminster Shorter Catechism has it). Our ability to give glory to God, and to enjoy God, comes from God. Whether or not we appear able to do these things or not is irrelevant: ‘faithful is he who calls you, who also bring it to pass’ (I Thess. 5:24). Delight in God does not depend on our cognitive abilities, but on the relentless love and boundless generosity of the God who brought us into being so that we could enjoy God forever. Regardless of our abilities, we human beings share one characteristic (which Peter Singer no doubt denies): we are made in the image of God. We who are able to recognize ourselves as participating in God’s being should do everything in our power to allow God’s love and God’s glory to be seen in and through us. Those who are not able to see it nonetheless participate in that love and that glory–and are less able to obscure the image through the evil inclinations of our hearts to which Genesis 6: 5 refers. Because we are all sharers in the divine image, Nostra Aetate 5 reminds us that ‘We cannot truly call on God, the Father of all, if we refuse to treat in a brotherly way any man, created as he is in the image of God. Man’s relation to God the Father and his relation to men as his brothers are so linked together that the Scripture says: “He who does not love does not know God” (1 John 4:8).’ The council makes no special provision: every person is created in the image of God, and deserves to be treated as our brother or sister. Thus even the relationships we have with one another depend upon a generous self-gift, a love that does not ask to be returned–a love that does not seek its own. We love insofar as we are able, not insofar as the beloved is ‘deserving’ of our love. No doubt Peter Singer would disagree, and without the belief that we are creatures of a God who has made us for relationship with God and for participation in divine life, what he says makes a lot of sense. But the babies whom he regards as undeserving of our care (and all those whose human lives Singer would find substandard) remind us that we all are destined for the same end, and all equally unable to reach that end without grace. The Holy Spirit who works in us works in us all; we are all in need of the Spirit’s work, whether we have the power of speech, or abstract thought, or mobility. We are for delighting in God, and God makes it possible for each one of us to do just that. 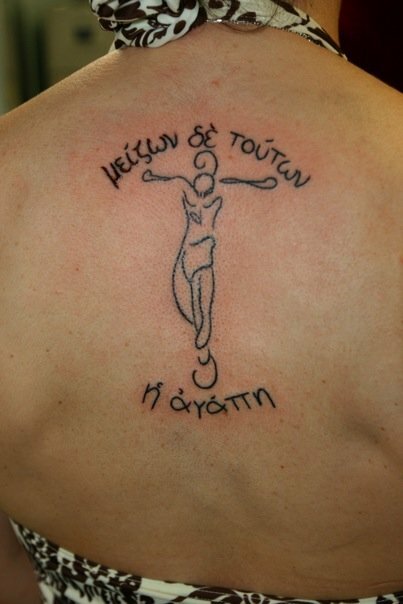 There it is, freshly inked–that’s why there’s a halo of reddish skin around it! So for the next couple of decades, I turned the idea over and over in my mind. Honestly. I never forgot that conversation with my mother. Now, I consider it a moment of parenting genius, not because that strategy would work for everyone–not at all. Rather, it was a moment of parenting genius because it took account (knowingly or intuitively) of the sort of kid I was, and the way I was likely to make decisions. It appealed to reason and vanity, which I had in rather unequal portions at 16. (You can guess which trait I had in greater abundance.) She never said “Don’t.” Other friends, over the years, said “Do!” or “Don’t!” but my mother never did. She was a little surprised, I suppose, when I finally got the tattoo, but by then I was well and truly grown-up. I don’t suppose it will be my last tattoo. I have other ideas. Chief among these is an addition to the tattoo I already have, one phrase, in English this time: “the image of the invisible God.” Maybe 2015 is the year for that.